Lake View Lad and Henry Brooke, pictured winning Newcastle's Rehearsal Chase, hold every chance in today's Grand National. 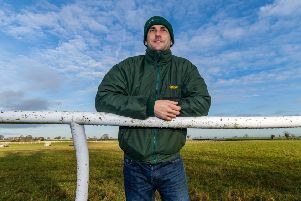 HENRY BROOKE is a fearless jockey who has previously led the Grand National. Now the North Yorkshire rider has, arguably, his best chance yet to win the world’s greatest steeplechase. He partners Lake View Lad who, just like Yorkshire’s great hope Vintage Clouds, is an eyecatching grey who runs in the colours of three-time National-winning owner Trevor Hemmings. Grand National contender Lake View Lad on the gallops at Cheltenham - the grey is a first runenr in the world's greatest steeplechase for trainer Nick Alexander. And while victory would be a fairytale for 28-year-old Brooke who was nearly killed in a fall at Hexham in 2016, there is no room for sentiment – he is on the leading horse because of his prowess as a horseman. High-profile wins in Newcastle’s Rehearsal Chase and Wetherby’s Rowland Meyrick Chase, followed by a fine third at Cheltenham behind the aforementioned Vintage Clouds, give trainer Nick Alexander grounds for encouragement. It is the former financier’s first National runner and much of the preparation work at his family’s stables in Scotland have been undertaken by his daughter Lucy, one of the North’s top riders in her own right. “In some sense, I would like Lucy to ride him but in another I am delighted Henry is on him,” Alexander told The Yorkshire Post. “He has a fantastic rapport with the horse and is a good hardworking jockey. He deserves all the success. Lucy is extremely professional and rode Lake View Lad on Thursday morning before he headed off to Aintree and is a key member of the team – it is a team effort. Though the affable Alexander admits to being nervous ahead of the race – he says it is all “a bit nerve-wracking” – he has also been encouraged by significant rain falling on Merseyside. Softer ground will play to the strengths of a nine-year-old horse who defied top weight when being placed at Cheltenham. “He surprised my expectations and he should strip a little fitter,” added the trainer. “That was very much the preparation. I’m hoping that he will be spot on for that. Fingers crossed. The horse has had a great preparation. It couldn’t have been better. Lake View Lad heads a strong Scottish challenge which also includes the 2017 National winner One For Arthur who is trained by Lucinda Russell and Peter Scudamore, the former champion jockey. And Stuart Coltherd, a sheep farmer by trade, saddles Captain Redbeard who will be ridden by his son Sam – a conditional jockey attached to the Bingley stables of Sue and Harvey Smith who are responsible for Vintage Clouds.